Treatment of fetal rat and embryonic chicken with exogenous glucocorticoids induces premature differentiation of growth hormone (GH) secreting cells. The effect of corticosterone (CORT) on somatotroph differentiation was mostly studied in pituitary cells in vitro. Currently, there is no evidence for glucocorticoid-mediated induction of somatotroph differentiation during pituitary development in bird species other than chicken. 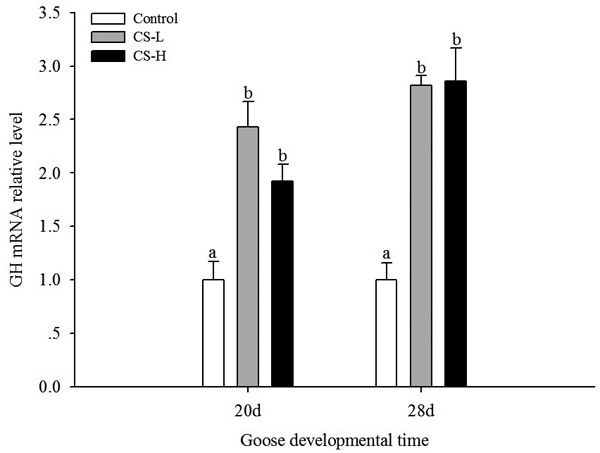 In this study, we sought to find out if in ovo injection of corticosterone into developing goose embryos could induce premature increase of GH in somatotrophs. On embryonic day (e) 15, the albumen of fertile goose eggs was injected with 300 μl of 0.9% saline, 300 μl 5 × 10–8M CORT, or 300 μl 5 × 10–6 M CORT. Embryos were allowed to develop until e20 and e28 and isolated pituitaries were subjected to quantitative real-time PCR and immunocytochemistry to detect GH mRNA and protein, respectively. At e20 and e28, blood from chorioallantoic vessels was subjected to radioimmunoassay for analysis of plasma GH protein. In ovo administration of exogenous corticosterone brought about a 2.5-fold increase in the expression of GH mRNA and increased the in situ expression of GH protein in goose pituitary cells, and enhanced plasma GH levels compared to that of the respective controls at e20. These findings prove that administration of glucocorticoid could stimulate the expression of GH in somatotrophs during goose embryonic development. Our results suggest the probable involvement of membrane glucocorticoid receptor in the corticosterone mediated expression of GH. Together with previously published data, our results suggest that corticosterone mediated induction of GH expression during embryonic development is relatively conserved among different vertebrates.